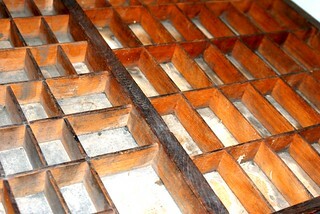 Wooden sort case. Wooden tray with individual compartments to hold different type characters. The type was often referred to as sorts. A sort is any single type characterThe upper case would be capital letters and the lower case would be filled with lower case type. This sort case is from Miller & Richard. Miller & Richard were a world famous Edinburgh type foundry. The firm supplied type to print firms all over the globe. The company was established by William Miller, who had trained at Alexander Wilson’s foundry in Glasgow. In 1809 he began operations out of Reikies Court, just off Nicolson Street. It expanded to take in the surrounding buildings including a chapel, a school, a lying-in hospital and finally a street was roofed over to make a woodworking shop. By 1825 the company was type founders for His Majesty of Scotland and when he was joined by his son-in-law Walter Richard in 1838 the firm became Miller & Richard. Miller & Richard founded a strong reputation of typographic innovation. They were responsible for founts such as the Miller & Richard Oldstyle and its boldface, now known as Old Style or Century Oldstyle; and Antique Old Style, or Bookman. The foundry closed in 1952, when the designs passed to the English company Stephenson Blake. This item is on display in the Ballantyne display at the Writer's Museum, Lady Stairs Close, Edinburgh.